This short article is an explanation of the weather patterns and diving conditions throughout the year in Phuket and the rest of Thailand. This is useful when planning your diving holiday. It will help you to weed through all the rumors and falsehoods one hears about the weather in Southeast Asia. I try to explain why we dive from October until May each year and why liveaboards generally do not run from June through September on Thailand’s West Coast. 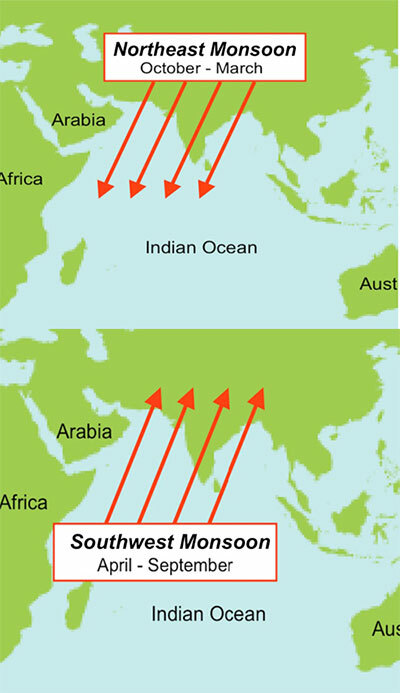 The term monsoon means “a weather pattern in Asia.” It is from the Arabic mawsim, meaning “season.” In Thailand, we have two monsoons or seasons, the northeast from October until May and the Southwest from June until September. We have three real seasons in Thailand; cool from November until January; hot from February until July; and rainy from August until November. While true, sailors and divers only care about the northeast and the southwest monsoons. The northeast monsoon lasts from October until May and is considered to be high season in Phuket and most the rest of Thailand. This is generally understood to be the best time of year for both traveling and scuba diving. The weather tends to be consistent and predictable during these months. This is lucky for Phuket as northern hemisphere winter is the most popular time for tropical holidays. The gentle breeze blows from the northeast and the West Coast of Thailand experiences wonderful weather. Boats can reach even the most remote islands throughout the Andaman Sea, including the Andaman Islands and the Mergui Archipelago. Sailing yachts depart for Africa during this time as the winds are favorable. Since it is surrounded by land-mass, there is no real ground swell in the Andaman Sea. It feels like a large lake within the Indian Ocean! Surfers, go elsewhere, there are no waves to speak of. During the months of February, March and April the Andaman Sea turns into a flat glassy millpond where more often than not you can look over the side of the boat and see your reflection in the water. It can be breezy in the morning, but it dies by noon. Thus, the morning may be choppy, but the afternoons are flat and smooth. At the beginning of northeast monsoon winds can be strong. During December and January the Gulf of Thailand experiences high waves and often boats to Koh Samui or Koh Tao cannot depart due to wave height. Because Phuket is on the west side of mountainous Isthmus Kra, land protects us from most wind. Some remote dive sites like Richelieu Rock and Hin Daeng may be difficult to reach on certain rare days. This pattern is very consistent and very predictable so boat captains know what to expect. Rarely do we need weather reports or weather satellite updates. It’s pretty much how it is every day. We can plan our travel according to the tides to avoid any chop, then get to a nice anchorage and enjoy ourselves. The southwest monsoon, beginning in May or June wind and waves come from the southwest and since Phuket is exposed to the west, waves hit the popular beaches making swimming difficult and dangerous. There are not too many nice beaches on Phuket’s east side, so people have trouble finding nice swimming beaches during that time here. Phi Phi, the islands in Phang Nga Bay, and the Racha Islands have nice swimming beaches on both sides making them popular day trips from Phuket. Rain is more common which makes the countryside more green, tropical, and beautiful. Flowers and fruit dig it. However, we can’t accurately predict the weather more than a few days in advance and this makes it difficult to plan dive trips. And, since most of our dive sites are well offshore, the liveaboards generally only run when we can safely and accurately predict the weather. This is the reason when you search for liveaboards you don’t find trips to the Similan Islands or the Mergui Archipelago a from June till September. The Gulf of Thailand, since it is protected from southwesterly winds, experiences flatter seas during the southwest monsoon. However, it rains there just as much as it rains in Phuket. The diving in Koh Tao, gets very nice in June through September making it a great time to visit this lovely little island. It’s far offshore so doesn’t receive very much rain. The problem is that the diving doesn’t compare to the Andaman Sea. Serious divers best wait for the northeast monsoon to visit Thailand. For those of you planning a hotel stay early or late in the season, keep in mind that Phuket is one of the driest provinces in Thailand and much drier than Phang Nga or Ranong provinces to the north or Krabi to the east. Phuket gets less rain overall than these other places. This is the main reason Phuket developed a tourism industry before other areas in southern Thailand. Compared to most other places in the world that are above or below 20º from the Equator, the weather here is pleasant. We rarely get typhoons or hurricanes or even tropical depressions. Besides the constant heat, we have some of the best, safest and most predictable weather in the world. During the northwest monsoon, people never complain of seasickness. The trick for diving here is having protection from the waves. Unfortunately, many of Thailand’s dive sites do not have protection from rough weather as we are diving at pinnacles and other areas offshore away from large islands. Fortunately, we rarely have seriously rough seas, and we can usually get back to protected areas quickly when necessary. Since the sea height is unpredictable during the southwest monsoon on the Phuket side, and unpredictable during the northeast monsoon on the Gulf side, it makes it difficult to plan trips to any areas that don’t offer proper protection from the waves. Thus, trips to Sail Rock in the Gulf and trips to Richelieu Rock from Phuket are difficult since these dive sites have little protection from the weather. Due to the distances involved in making trips to Burma (Mergui trips are usually a 1,000km round trip), we generally do not schedule trips to these areas during the southwest monsoon (June until October). Since distances to the dive sites of better quality (Similan, Burma, etc.) are further away, we normally do trips there for several days. Therefore, to plan trips of any length of time we need to be reasonably sure that the diving will be good when we get there. And that there are safe and comfortable anchorages for the customers on board. Another consideration is getting divers on and off the boat safely and comfortably. If the waves are too large, then the dive platform can be a dangerous place if you’re trying to re-board the boat. Similan & Surin Islands All Year Around? As of 2007, the Thai Government has officially closed Mu Koh Similan and Mu Koh Surin National Parks to tourism from May 15 until October 15 every year, giving them a much-needed rest from human activity. One of the islands which offers world-class diving year-round, Koh Similan, is large enough that if there are waves, we can get shelter behind the island (on the East Coast). And, since the Similans are almost 40 nautical miles from shore, visibility is never affected by rain run off. In fact, during the southwest monsoon, since the water is moving up from the southwest, waves and currents are bringing in clear, clean water from offshore. The main problem diving the Similan Islands during the summer months, June until September, is the lack of people wanting to go–not that we physically cannot. At that time of year, people are traveling to more temperate climes rather than the hot tropics, so historically there are very few scheduled liveaboards during this time as we can’t get enough people together on a consistent basis. Almost every boat at one time or another has tried a summer schedule and few, if any, have ever been financially successful at it. While it’s legally possible to dive the Mergui Archipelago during the summer months, the distances involved make it impractical. Most companies don’t bother publishing a schedule and turn to vessel maintenance. Also, it could be dangerous or terribly inconvenient as you may be able to get out to the islands, but weather conditions could make it impossible to return to port and you’d be stuck until the weather clears. After all, it is the same archipelago the Similan and Surin Islands lie. Tough luck if you have a plane to catch. Since day diving destinations do not have long travel times, nor do they have to be planned in advance, almost all dive centers in Thailand offer fine diving at all the popular spots around Phuket and Phi Phi Island in the Andaman Sea, and Koh Tao, Samui and Pattaya in the Gulf of Thailand (Siam). Off season is a great time to visit Thailand as prices are down, there is less traffic and people on the roads, and more options for general tours and hotels since there are fewer package tourists here. Visibility is generally not very much different between high season and low season as visibility is affected more by plankton and algae blooms rather than freshwater run off. If we’ve had heavy rain or a long storm, visibility drops, but after a few days it’s right back at good again. So, if you’re here during our “Green Season” you can dive, but a liveaboard will not be possible. Tsunamis are extremely rare, caused by earthquakes and are obviously not a weather condition. Yet, we had one on December 26, 2004, that caused a huge loss of life especially on the coast north of Phuket around Khao Lak and in Phi Phi Island. No one expects this to happen again in any of our lifetimes. Phuket fully recovered from the effects of the waves in a few weeks. Khao Lak and Phi Phi have recovered completely as well (though it took longer there as most hotels had to be rebuilt) and all destinations on the west coast are busier than ever. Diving conditions are normal and pretty much the same as prior to the tsunami as our activities take place in deeper water where the waves just passed over (no one died underwater in the tsunami as far as we know.) Some coral reefs which lie in shallow water were exposed to heavy surf and strong currents suffered damage, but divers do not generally see this as we don’t dive in these areas. Despite erroneous reports, the 2004 Andaman Sea tsunami did no permanent damage to dive sites.